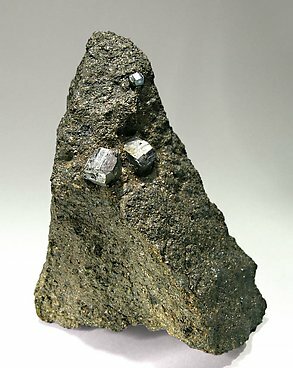 This esthetic sample shows three sharp and brilliant Cobaltite crystals, one of them with a good size, with dominant forms of the cube and pyritohedron. All are included in a massive Pyrrhotite matrix. We found that the crystals are not reattached to the matrix but are included in it in a natural way. With the specimen we will send the Folch collection card Nr. 11.165.